A cold front will pass through the Stateline shortly after midnight A few showers are expected before the passage of the front. Dryer air moving in behind the front will cause skies to become partly to mostly clear before daybreak. It will be breezy and cooler on Sunday under mostly sunny skies. It will be mostly clear and cold on Sunday night with a low in the middle 30's. There will be a chance of some spotty frost in low lying areas away from cities. The good news is that no rain is expected through Wednesday. So, we will get a chance to dry out. The next chance of showers and thunderstorms will be on Wednesday night, continuing into Thursday. The warmest day of the week looks like it will be Wednesday with a high in the middle 60's. AFTER A REVIEW OF THE DAMAGE PHOTOS TAKEN DURING THURSDAY/S GROUND SURVEY AND CONSULTATION WITH NATIONAL EXPERTS...THE NATIONAL WEATHER SERVICE IN MEMPHIS HAS UPGRADED THE SMITHVILLE TORNADO RATING TO EF-5 DAMAGE. THIS IS THE HIGHEST RATING FOR TORNADO DAMAGE AND THE FIRST EF-5 OR F-5 IN MISSISSIPPI SINCE THE CANDLESTICK PARK TORNADO NEAR JACKSON ON MARCH 3RD 1966. * SUMMARY OF DAMAGES: 18 HOMES DESTROYED...2 BUSINESSES /POST OFFICE AND POLICE STATION/ DESTROYED...8 HOMES WITH MAJOR DAMAGE...7 BUSINESSES WITH MAJOR DAMAGE...44 HOMES WITH MINOR DAMAGE...AND WATER SYSTEM DESTROYED. MOST TREES EITHER SNAPPED OR TWISTED AND DEBARKED. MOST THE HOMES DESTROYED WERE WELL BUILT...TWO STORIES...LESS THAN TEN YEARS OLD AND BOLTED DOWN TO THEIR FOUNDATIONS. AN 1965 CHEVY PICKUP TRUCK PARKED IN FRONT ONE OF THE DESTROYED HOMES HAS NOT BEEN FOUND. ALL APPLIANCES AND PLUMBING FIXTURES IN THE MOST EXTREME DAMAGE PATH SHREDDED OR MISSING. The tornado outbreak of April 27th, 2011 will have it's own place in history. The month of April 2011 will almost certainly set a new record as well. The most tornadoes in a day and most tornadoes in a month are the two records likely to fall. 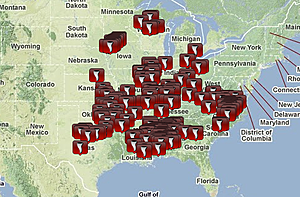 This image shows the number of reported tornadoes at this point. Note: not all of them have been verified. But as the NWS continues to do damage surveys over the next several days, a clear picture will be painted as to exactly how exceptional yesterday and this month of April were in the tornado record books. If you have any sensitive vegetation outside, you might want to cover it or bring it into the house tonight as a frost advisory is in effect for Stephenson county and the counties bordering the Mississippi River from 4am 'til 9am. For Winnebago, Boone, DeKalb, Lee, Ogle, and McHenry counties, the frost advisory is in effect from 3am 'til 9am. Frost is also likely for most of our Wisconsin viewers. The NWS offices in Wisconsin haven't issued an advisory for Green and Rock counties. This is probably because freezing temperatures are still common enough in those areas at this time of year that an advisory isn't needed. Penny Zabel, meteorologist with the NWS Milwaukee, shared this video of the aerial footage from Tuscaloosa. No words can describe this. The Importance of Severe Weather Preparedness! A MUST READ! ROMEOVILLE, IL, APRIL 28, 2011: It has been more than 20 years since the Chicago area has seen a violent tornado, however, the vivid images of death and destruction coming in from the southeast U.S. should serve as a reminder to Chicagoans of devastating effects of a direct hit from a violent tornado. The last violent tornado to strike the area was August 28, 1990, when an EF-5 tornado leveled portions of Plainfield and the southwest suburbs of Chicago. The long period of time that has elapsed since this tornado has led to many Chicagoans developing a sense of complacency, however, the recent rash of violent tornadoes striking major metropolitan areas should serve as a wake-up call and result in a greater sense of urgency to ensure preparedness for a tornado. The images of homes completely destroyed and cars tossed around like toys is a testament to the power of tornadoes and reinforces the urgency of having a plan in place ahead of time of what to do when a tornado is coming. Given the Chicago area’s historic vulnerability to violent tornadoes, such as the ones that left hundreds dead Wednesday, it is imperative that everyone in the Chicago area not only have a way of receiving warnings but also know what they will do when a warning is issued for their area. NOAA Weather Radios serve as an invaluable tool in receiving warnings and can be programmed to set off an alarm whenever a tornado warning is issued for a particular area. Preparing ahead of time and making sure everyone in your household knows where the safest place to be during a tornado is imperative. While the 2011 severe weather season has gotten off to a slow start in the Chicago area, the slow start to the season does not serve as a predictor as to how busy the rest of the season will be. Typically, La Nina patterns, like the one we are currently in, result in more frequent and more significant tornado outbreaks across the central and eastern United States. As the jet stream begins its seasonal migration northward the threat of tornadoes, and possibly strong to violent tornadoes, will likely be on the increase over the coming weeks in the Chicago area making the need to plan now even more urgent. It will continue to remain breezy and chilly this afternoon. The backside of the upper level low will continue to move across the eastern Great Lakes but not before breezy northwest winds keep temperatures in the upper 40s and low 50s. We'll likely see a few scattered showers rotate through today, and maybe even a mix of snow - especially to the west. Tonight will be cool as temperatures dip into the low to mid 30s. High pressure moves in Friday bringing some sunshine and temperatures rebounding back into the middle 60s! Those temperatures will stay on Saturday before a cold front sweeps through and brings a chance of thunderstorms late in the day. Death toll continues to rise: As of this morning it stands at over 170 people. Watching all of this and I can't help but cry!! You can donate to the Red Cross to help those in need. SPC: 141 reported tornadoes Wednesday (remember these have to be confirmed so the number may go down some). Reports of more than 400,000 without power in Alabama. More video coming out of the tornado that hit Tuscaloosa, AL Wednesday evening. The Weather Channel is reporting that 70 people, or more, have lost their lives with the storms that moved through Mississippi, Alabama and Georgia. At least 58 of those have come from Alabama. From WROK Scot Bertram: Mayor of Tuscaloosa says at least 15 people have died in tornadoes in his city. Storms continue to move east tonight with tornado watches extending from the south into the northeast. Crystal Paulk-Buchanan, Georgia EMA-PIO, reports serious damage in Catoosa County, Georgia. Also reports coming in of a mass casualty trailer being requested in that county due to injuries/fatalities and people missing. Storm Prediction Center: As of 7:30 pm there have been 109 preliminary reports of tornadoes in the south! How would you like to walk onto your front porch and see this? This is a picture of a wedge tornado that ripped through the Tuscaloosa, AL area within the past half-hour. Tornadoes continue to rake the South this evening, from Alabama into Tennessee and the Carolinas. Makes our cool, wet weather seem more tolerable in my opinion! It's all preliminary, but here are the numbers of deadly tornadoes in 2011 running through Tuesday evening. One very interesting note from this year is the number of people that have died just in the month of April, alone! Now the storms that moved through Tuesday evening may add on to that once damage surveys are done. But just to put this into perspective, there were only 45 people that died from tornadoes for the entire year of 2010! Unfortunately, the vast majority of those came from the storms that moved through North Carolina and a lot of the fatalities were from people who lived in mobile homes. So with all the recent severe weather this month it may have you asking just what the rest of the spring and summer months hold. You may remember I touched a little bit on this the other day. Weekend meteorologist Eric Nefstead and I were talking and felt as if later this year could possibly be an active one for people in the Great Lakes and Midwest in terms of severe weather. His reasoning: the severe drought in the deep southern Plains and the cool and wet northern Plains. Yesterday we met with the meteorologists with the Chicago National Weather Service, along with fellow meteorologists in the area, to discuss just that; what does the rest of spring hold. Currently, we are in the process of transitioning from a moderate La Nina this past winter to a weaker La Nina or even a neutral ENSO by late spring/early summer. So just what exactly does this mean in terms for us? The severe weather season typically starts in the south early in the season; March & early April. This is because the jetstream, which you can think of as the highway for storms, sits along the southern states. As the spring and summer months continue the jetstream shifts further north taking the severe weather with it. We typically tend to see our severe weather season around June or even early July. Believe it or not, I went storm chasing in Canada mid-July!! Looking back at past La Nina events, or the climatology, we tend to see a cool pocket of air develop along the northern tier of the county with warmer than average conditions in the south. You can almost look at the current conditions and see that this has, in fact, played out with the ongoing drought and heat in Texas and the cooler than average temperatures in the north. As the jetstream begins to lift north within the next month or so, we'll likely see an increase in thunderstorm activity shift northward as well. Looking back at both 2008 and 2010 one of the meteorologists with the NWS pointed out that there was an above average amount of tornadoes that occurred throughout Illinois. A lot of this season will depend upon just where that boundary between the cool and warm air sets up. So far it has been in the south, and with a powerful jetstream this has lead to the record amount of tornadoes this month. Now I'm not saying that we will see those type of severe weather numbers here, but climatology tells us that we could see an 'above average' storm season. Now is the time to be prepared! Make sure your family has a preparedness plan and most importantly a NOAA weather radio. 7:30 am Update: Rain, moderate at times, will continue to lift northward along a cold front this morning and likely move into the Rockford metro within the next 20 minutes. Light rain already being reported through Rochelle, DeKalb and Freeport. Keep the umbrellas handy as we'll need them through the morning and possibly in the afternoon. After picking-up 0.75" of rain at the Rockford airport last night and today, the rain we have in the forecast tomorrow looks much lighter. Low pressure will move across Northwest Indiana during the day, which is further east than the low that impacted the Stateline today. This easterly track means we'll be on the cooler, drier side of the low with mainly just wrap-around, scattered showers. Our forecast models drop anywhere from about one-hundredth to a quarter-inch of rain on the Rockford area. The higher-end totals are more likely to show-up in McHenry and DeKalb counties, while Stephenson county may actually stay dry. 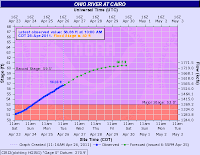 Record flooding is forecast on the Ohio River at Cairo, IL. This would exceed the 1937 flood. 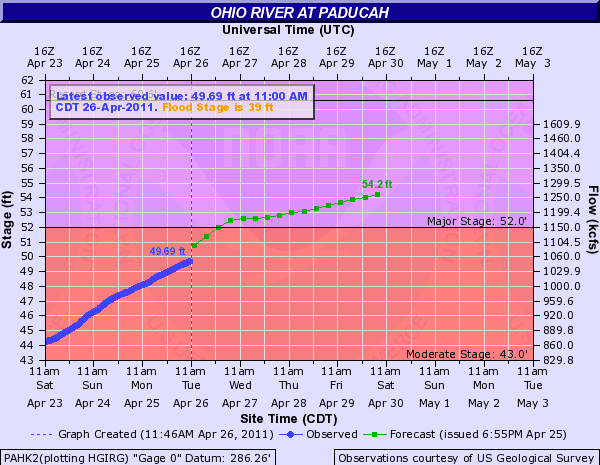 River Stage at Paducah, KY on the Ohio River is currently forecast to be the highest since the 1937 flood. This isn't good. After parts of Texas and Arkansas dealt with tornadoes Monday afternoon and evening, it unfortunately looks like those areas could be hard hit again. An outbreak of severe weather, including long tracked tornadoes, could be possible for southern Arkansas, northwest Louisiana, Oklahoma and northeast Texas. Along with the threat for tornadoes comes damaging winds and large hail. Storms are expected to develop again this afternoon and evening along a warm front that will reside through Texas and into Arkansas. An upper level disturbance coming through will help to generate strong storms as moisture continues to surge from the gulf. This April will definitely be one for the record books. This has been a very active month in terms of severe weather. The Weather Channel's severe weather expert, Dr. Greg Forbes, says there have been 292 confirmed tornadoes so far this month in the U.S.; breaking the old record of 267 set back in 1974! On average, the month of April only sees about 163 tornadoes. There have been six severe weather outbreaks with many of them lasting for several days. Today could possibly make it number seven. What really saddens me is the fact that over 40 people so far this year have lost their lives with these storms; most of them in the month of April and during the tornado outbreak in North Carolina a couple weekends ago. In Arkansas yesterday it's been reported that four people died from tornadoes while three others died from the flood waters. The heavy rainfall that fell overnight continues to lift north this morning as low pressure moves into northwest Illinois. Totals range anywhere between 0.64" at the Rockford Airport to over an inch in Freeport and Rochelle. While the skies are mainly rain free this morning a few more scattered showers may redevelop later today as the main low moves through. Although this severe weather season is arguably off to a slow start across the Stateline, that's not the case for other parts of the country. You may remember a tornado outbreak almost two weeks ago that slammed areas from the deep South to the east coast. And just three days ago, an EF-4 tornado devastated the St. Louis area. So far, there have been more than 560 reports of tornadoes in the U.S. this April. Although many of these reports have yet to be confirmed, we are well on our way to setting a record. April of 1974 had 267 confirmed tornadoes, the most on record for the fourth month of the year. So even if just half of the above tornadoes are confirmed, we will set a new record for April tornadoes in the U.S.
Another thing to consider, we've got five days left in the month. And tomorrow already looks like a busy tornado day from Texas into the Ohio valley! One of our viewers, Dom Castaldo, shared this article with me about a week ago. Coming from a farming background I found it to be interesting and maybe you will, too. Grain prices reaching historic levels do more than just drive up the cost of feeding livestock. The demand for grain also increases soil erosion, and across wide swaths of the Corn Belt, soil is being lost at rates much higher than official estimates, according to a report issued this week by an environmental group. However, the EWG analysis suggests heavy rainstorms in Iowa over recent years have increased erosion by as much as 12 times the rate the NRCS calls sustainable. That erosion is greatest in western Iowa, and other regions of the state that are more rolling. The erosion problem will only increase, the researchers say, as higher grains prices encourage farmers to increase tillage and plantings on as much of their land as possible. At the same time, they note, Congress is considering cuts to the national budget that will decrease programs that encourage soil-conserving practices. Many farmers in recent weeks have recognized their neighbors are aggressively converting land to row crops this year in an effort to capitalize on rising corn and soybean prices. Much of that land would be considered “highly erodible,” increasing the likelihood Corn Belt erosion will increase as grain prices increase. EWG believes farmers should be required to maintain strips of grass or trees at least 35 feet in width along rivers, streams and lakes to protect them from runoff. The group also has encouraged USDA to increase enforcement of a law that requires farmers to take measures to protect highly erodible land from soil loss or else risk losing federal subsidies and loans. Jack Hayes, National Weather Service Director, reflects on the tragic loss of life and offers some lessons learned from the recent tornado outbreak that hit communities across North Carolina a week ago. SILVER SPRING, Md. -- As the director of the National Weather Service, I was saddened to see so many people lose their lives during the tornado outbreak last week. As communities across North Carolina and other storm-ravaged parts of the country clean up and heal, there are stories of survival that provide some solace and even inspiration during this difficult time. There are also valuable lessons that I want to offer to help prevent such devastating losses of life during future storms. The sprawling storm that confronted us dropped tornadoes from Oklahoma to the Carolinas. We've seen powerful and deadly tornado outbreaks like this before; so, we were able to issue forecasts days before the devastation. Hours before the storms hit we placed communities under a watch, meaning conditions were favorable for severe thunderstorms and tornadoes. And when tornadoes began to form, National Weather Service warnings urged residents to seek shelter immediately, providing a life-saving alert 23 minutes, on average, and in some cases upwards of an hour before the tornadoes arrived. The ability to predict with such confidence did not occur overnight; instead, this is the direct result of a national investment in skilled forecasters, sophisticated atmospheric modeling and advances in technology such Doppler radar. Without this national initiative and a continued investment to sustain the infrastructure, the capabilities we have in forecasting today would be just a concept and not a reality. Many people were quick to respond to the warnings - they sought shelter and got out of the way of the tornadoes. While a system this powerful means that even advance warnings like these can't prevent all of the casualties, history tells us without the warnings it would have been far worse - an outbreak in April 1974 claimed more than 300 lives. Reflecting on this recent severe weather outbreak, the first lesson is: Warnings work only if you have a way of receiving them. The ability to predict and warn is only part of what is necessary to save lives. Monitor your local television or radio news to know when your community is under a warning and then take precautions. And have a NOAA Weather Radio that will grab your attention when a warning is issued - this is especially critical when storms strike in the middle of the night. We are constantly working with local emergency officials, the media and America's weather industry to help improve the delivery of National Weather Service warnings to threatened communities. The second lesson of this outbreak: Take proper precautions when a warning is issued, especially since it can appear to be deceptively non-threatening outside at that moment. Severe weather can strike fast. Seek shelter in the interior section of the lowest floor of a sturdy building - or even better, below ground - in the case of an approaching tornado. The final lesson: Capturing a tornado on your digital camera or cellphone could be a fatal decision. Filming at dangerously close proximity puts people at risk of being hit directly by a tornado or by the flying debris swirling around the funnel at tremendous speeds. I ask you not to become a statistic for a thrill - your family and friends will be the ones left behind wondering why. Tornadoes can strike anywhere at any time under the right conditions. Forecasters are continually monitoring the sky for signs of danger and will provide the most timely and accurate warning as possible. I urge everyone to use this information to stay informed and to take steps to protect their lives and the lives of loved ones. Jack Hayes is the director of NOAA's National Weather Service. This video really adds something to Jack Hayes's final lesson: trying to capture a tornado instead of seeking shelter. This is a perfect example of what NOT to do! All too often the thrill of chasing to get the video can put people in a very dangerous situation; like this gentleman. The active weather pattern of late will continue through the week. The week starts with a quasi-stationary front stretching from the Texas panhandle northeast across Oklahoma, southern Missouri, the extreme southern tip of Illinois, and on up the Ohio River into Pennsylvania. The front will serve as a focal point for heavy rains and severe weather well to the southeast of the Stateline. Gulf moisture to the south of the front will ride up and over the front spreading clouds across northern Illinois tonight and Monday. The front will make a slight northward push on Monday into Monday night, and scattered light rain showers will develop on Monday morning becoming more widespread toward evening. The clouds, and an easterly breeze will keep temperatures in the 50's on Monday. Monday night will be a rainy, breezy night with some thunderstorms thrown in for good measure. None of those storms are expected to be severe in the Stateline area. By Tuesday morning low pressure will be intensifying as it moves across northern Illinois heading off to the northeast. More showers are expected on Tuesday as it pulls across Wisconsin, Lake Michigan and into northern lower Michigan. Another low pressure storm center will develop over Arkansas on Wednesday continuing chances for more showers Wednesday, Wednesday night, and Thursday. By Friday the weather will settle down as high pressure takes over giving the Stateline mostly sunny skies, and comfortable temperatures in the middle 60's. The good weather will be short lived, however, with the threat of showers and thunderstorms returning on Friday night continuing into Saturday. High pressure cannot even clear out the clouds. An area of high pressure will move from the northern plains tonight, across Wisconsin on Easter Sunday, and then off to the east. It will pass close enough by to the north that it would ordinarily produce a nice sunny day for us on Sunday, but it is weak, and it is being over-ridden by moisture moving northeast over and above a quasi-stationary front stretching southwest to northeast from the southern plains of Oklahoma, across Missouri, southern Illinois, central Indiana into central Ohio. The moisture is producing widespread cloud cover, and a little bit of light rain and sprinkles into the southern portions of the Stateline tonight. Some of those sprinkles could edge as far north as the Rockford area, but very little rainfall is expected, and it should be over by morning. Easter Sunday will not be quite as nice as you would like to see with mostly cloudy conditions along with temperatures reaching the upper 50's during the afternoon. As low pressure becomes a little better organized by Sunday night, some light rain showers could develop northward into the Stateline once again. A better flow of moisture will feed northward as the low spins itself up over Missouri later on Monday that will push the front a little northward and generate more widespread rains and even some thunderstorms. Showers will be continuing into Monday night, along with some rumbles of thunder. That system will spin off to the northeast across Wisconsin by early Wednesday, but there may still be some scattered showers lagging behind as another disturbance develops over Arkansas. That system will combine with the original system over northern lower Michigan, and continue to intensify by early Thursday morning. It will be windy as the system moves though and passes off to the northeast. Scattered showers will remain in the picture through Thursday. It looks like we may finally get a break with some decent weather possible with mostly sunny skies and warmer temperatures on Friday. The high may reach the middle 60's. Rain may move back in again with the next system on Saturday. As expected, the storms moving through the Stateline tonight have stayed below severe criteria. Pea-size hail and wind gusts between 30 and 40 mph have been the general rule with these storms. Look for a chance of showers and storms through about midnight tonight, then drier air should work into the Stateline as low pressure moves to our east, and a cold front swings through behind it. Temperatures tomorrow with some sunshine will actually be warmer than they were today despite the passage of a cold front. Let's hope so! Highs today were only in the 40s! With a series of systems lined up to move pretty much over the same areas within the next several days, significant flooding will be possible to main rivers and tributaries in parts of the Mississippi, Missouri and Ohio Valleys. The first low will pass through later this evening sweeping a cold front through the lower Great Lakes. That front will then stall along the mid-Mississippi Valley this weekend keeping the bulk of the heavy rain showers to the south. Another low pressure system will begin to develop and ride right along that boundary pulling it northward. As it does, it will continue to draw in moisture from the Gulf of Mexico with heavy showers and thunderstorms through Monday. After that one passes another will develop and pretty much take the same track as the previous two. This will bring continued rain chances, not only to us but to residents in the south, during the first part of next week where totals could be locally over 6"-8" for some. Flooding has already been a concern for some residents this spring, especially in Ohio. The soil in those areas is completely saturated and simply can't hold any more rainfall. In advance of this Flash Flood Watches have been issued while Flood Warnings have already been ongoing. For us, depending on how far the lows track we might squeeze out an inch or two by the end of next week. The 31st Annual Fermilab/WGN-TV seminar will take place Saturday, April 30th at noon and also at 6pm. Admission is free; seating is on a first come, first serve basis. It is recommended you arrive early to ensure you get a seat. Dr. Louis W. Uccellini, Director of NOAA's National Center for Environmental Prediction (NCEP): "Forecasting the Blizzards of 2010-2011"
Dr. Jim Angel, State Climatologist, Midwestern Regional Climate Center: "February Blizzard's Astounding Impact"
Jim Reed, Award Winning Photographer: "Storm Chaser: A Photographer's Journey"
Jim Allsopp, Warning Coordination Meteorologist, NWS Chicago: "Tornadoes in the Chicago area: How often have they occurred and how do events like La Nina have an impact on local tornado occurrence?" Brian Smith, Warning Coordination Meteorologist, NWS Omaha, Nebraska: "Killer Wind: Do not ignore Severe Thunderstorm Warnings"
Dr. Mary Ann Cooper, MD, University of Illinois-Chicago: "The lightning injury rate in the U.S. is down but lightning injuries and deaths remain high in tropical and sub-tropical countries. What is being done to change this?" Ed Fenelon, Meteorologist in Charge, NWS Chicago: "Rip Currents: Killers on the Great Lakes, but what are they and what do you do when they strike?" Today is Earth Day and we want to know if you plan to celebrate. Maybe helping plant a tree, when the weather is a little less wet, reuse and recycle, take shorter showers. Is there anything going on in your community or activities that you will be taking part in? Let us know! 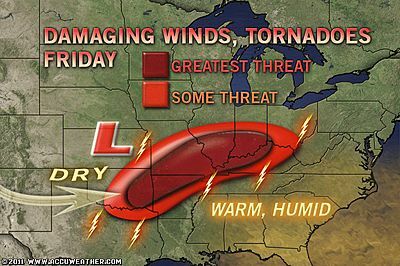 Earlier this week, it looked as though a severe weather outbreak would reach the Stateline. It now appears that it will stay to our south. Low pressure moving into eastern Kansas and western Missouri will bring a warm front northward, but that front probably will not reach the area. This means cool, overcast conditions will prevail here with scattered showers and non-severe storms. Peeks of sun, however, in southern Illinois and other areas south of that front will destabilise the atmosphere enough for the potential for severe weather. In addition, an upper-level disturbance will move through central sections of Illinois during the afternoon to help fire those storms. It's a day that many who lived through it, and even those who didn't, will never forget. Today marks the 44th anniversary of the Belvidere torndao. The F4 tornado touched down at 3:50 pm roughly two miles southeast of Cherry Valley. It then passed through the Chrysler plant destroying hundreds of vehicles. From there it moved east/northeast towards Belvidere where most of the destruction occurred. The Chicago National Weather Service put together a very nice summary for the 40th anniversary of not only that tornado, but others that moved through northern Illinois. You can find it here. What do you think? This is the Day 2 Convective Outlook, which would be for Friday. Notice the color coding? Another neat feature is the ability to add in population, NWS forecast coverage, counties and interstates. So do you think this is better than the old convective outlooks? I actually think it's pretty cool! To take a closer look click here: Storm Prediction Center and go under the Convective Outlooks tab. The beginning of April started strong with temperatures actually sitting above average and it wasn't until the middle, the 14th to be exact, that we fell below and remained there. So just what does the rest of spring and summer look like in terms of temperatures? At least for the beginning of the last week of April it appears as if temperatures will sit slighty above average with the upper 60s in the forecast for Monday and Tuesday before falling back into the low 60s towards the middle of the week. A strong jet streak (stronger winds within the jetstream) will push into the Pacific Northwest later this weekend. What that will do is help develop a trough in the western parts of the U.S. while a ridge builds across the eastern Great Lakes and East Coast. This will also increase our chances for above average precipitation during that period as we'll be pulling a little more moisture in from the Gulf of Mexico with each system that passes. Those warmer temperatures, unfortunately, appear to be short-lived as we look into May, June and possibly July. Looking over the next couple of months I feel as if the remainder of spring and even the beginning of summer will fall below average in terms of temperatures. La Nina was in full force during the winter of 2010-2011. We are slowly starting to see temperatures around the equator in the Pacific warm which would indicate a return to ENSO (El Nino Southern Oscillation) neutral conditions by June. Another indicating factor that makes be believe we may be running a little on the cooler side is when looking at the forecast NAO (North Atlantic Oscillation) and AO (Arctic Oscillation) they fall negative by the beginning of May. The AO is a difference in air pressure between the Arctic and the mid-latitudes. When the AO is positve, air pressure over the Arctic is low and pressure over the mid-latitudes is high. The prevailing winds keep extremely cold air in the Arctic. But when the AO is negative the pressure gradient weakens. The air pressure over the Arctic is not as low and not as high in the mid-latitudes. This enables Arctic air to slip south and warm air to move north. The same thinking can be applied to the NAO. When I see both of them turn negative towards the first of May it makes me think we will have some cooler days awaiting us. As far as the rest of spring and summer look a lot of the climate models have either ENSO neutral or even cool conditions for May, June and July and then either staying neutral or warming (which could be a sign of El Nino returning) by August, September and October. With that, my gut wants to tell me that overall we will likely see a cool spring and summer and could hold off on the heat until the end of summer and even early fall. Now I don't think that every single day during that time frame will be cool. We will probably see our fair share of heat and even severe weather. Chief Meteorologist Ty Shesky brought up a valid point that there could be other factors that will influence our weather locally. He noted that we should keep an eye on the drought situation developing in the southern Plains because a drier soil and strong southwest flow would allow temperatures to warm closer to home. However, we might not see many times when the flow is from the southwest if the jetstream does in fact reside to our south. It will be interesting to see how the next couple of months pan out and see if my prediction does in fact hold some truth. Pea to quarter sized hail will remain a possibility with any storms that develop throughout the evening. Also look for heavy downpours and gusty winds. 04/19/2011 E0.75 INCH DEKALB IL PEA TO DIME SIZED HAIL. NICKEL SIZED HAIL IN THE CITY OF ROCKTON. HONONEGAH RD. AND IL RT. 75. 04/19/2011 E0.75 INCH WINNEBAGO IL MOST STONES 0.25 TO 0.50 INCH WITH A FEW CLOSE TO 0.75INCH. Scattered thunderstorms will continue to move northeast this afternoon with brief heavy downpours, gusty winds and even pea sized hail possible. Storms moving through Whiteside county will continue to move northeast into Stephenson and Winnebago counties within the next 30 to 45 minutes. It's been no surprise that the weather the past couple of days has been on the chilly side. With accumulating snow Monday morning and a little bit of snow Tuesday morning temperatures have been running well below average. Today, we are going to be a good 20° below where we should be for this time in April. The jetstream over the next week will sit right through the middle of the U.S. with storm systems developing pretty much every other day. The first is coming through today and will move to the south through central Illinois. Once again we are on the north side with a brisk northeast wind and chilly rain throughout the day. Once this one moves out another will be hot on it's tail and move in late Thursday and be with Friday. With the jetstream running overhead temperatures are going to be on the cooler side until possibly this weekend when we could see a return of the low 60s (fingers crossed). We'll have to watch the track of the next couple of lows because if they continue to track to the south then we'll have to lower our temperatures through Easter weekend. (11:50:10 AM) nwsbot: DVN: 6 E Galena [Jo Daviess Co, IL] trained spotter reports HAIL of half inch size (E0.50 INCH) at 11:29 AM CDT -- cocorahs report. 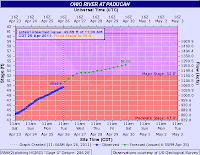 (11:30:05 AM) nwsbot: DVN: Galena [Jo Daviess Co, IL] co-op observer reports HAIL of pea size (M0.25 INCH) at 11:29 AM CDT -- lots of pea size hail falling. 10:30 am Update: Moderate rainfall continues to fall across north-central Illinois and south-central Wisconsin while thunderstorms move south of I-80. Places like Rockford, Belvidere, Polo, Genoa, Kingston, Forreston, Byron, Janesville and Milton will continue to see the moderate rain. There is one cell moving into Whiteside county just southeast of Clinton, IA that will likely produce a few rumbles of thunder this morning. 8:00 am Update: A few light rain showers passed through during the overnight with even a couple light snow showers across southern Wisconsin. While those continue to move northward another band will lift northeast out of southern Iowa later this morning. These are forming ahead of a warm front that currently sits through central Illinois and northern Missouri. A few reports of pea to dime sized hail is falling with some of the stronger storms in southeast Iowa. This line will likely weaken some as it moves into northern Illinois as it runs into a little more of a stable airmass, but we may continue with our rain/snow mix this morning before changing over to rain showers through the early afternoon. Wouldn't be surprised if we saw some pea-sized hail or even sleet mixed in. We may see a break in the rainfall before the low the moves into west-central Illinois by this afternoon. That's when I do expect a few more showers to fire up with severe weather likely through central and southern Illinois. At Chicago's O'Hare International Airport this morning, 0.6" of snow fell. That's a lot for April 18th! In fact, it was enough to beat the record snowfall of 0.4" of snow that fell on this date way back in 1910! No records fell at the Rockford Airport this morning as only a trace of snow was recorded. Many outlying areas saw close to an inch of snow, however. Overnight and Tuesday, look for more precipitation to fall as low pressure to our southwest travels along a frontal zone that extends from southern Illinois back into southern Kansas. The precipitation will fall as a mixture of rain and snow tonight, then mainly rain tomorrow. Some thunder could be heard across the Stateline, with severe storms possible just 100 or so miles to our south. A disturbance moving along an east/west stationary front to our south pulled moisture up and over the front into northern Illinois. Initially, it was warm enough that all of the precipitation was in the form of rain, but eventually it got cold enough to produce a wet snow across the northern counties of Illinois from the Mississippi River eastward to Lake Michigan. The grass was white by daybreak, and cars that were sitting outside overnight had about a half inch of slushy snow on the roofs and windshields. The disturbance has moved east, and the snow has come to an end, but skies remain cloudy. Temperatures will not go up much today with a damp breeze from the east at 10 to 15 mph under cloudy skies. Area high temperatures this afternoon will struggle into the middle 40's. That's about 15 degrees below the average high for today which is now at 60 degrees. The next major system to contribute to Stateline weather is about to put itself together over the central/southern plains. A surge of low level moisture will be drawn northward up an over a stationary front lying to our south, and rain will begin again tonight. It will be cold enough that some snow could mix in to the northwest of Rockford overnight. Tuesday will be a nasty, rainy, windy, raw, day with a chance of some embedded thunderstorms. The wind will make it feel extra chilly as is cuts in from the east to northeast at 15 to 20 mph with gusts up to 30 mph. High temperatures are expected to only be around 40 degrees on Tuesday. Rainfall could add up to around 1" on Tuesday. The snow we saw Saturday afternoon might not be the last unfortunately. Taking a quick glance at some of the recent weather runs and they point to another rain/snow mix or just plain snow showers by Monday morning. An area of low pressure developing in the Plains will move east tonight keeping a warm front to our south. An upper level disturbance will interact with moisture lifting northward as colder air changes over any rainfall we may see initially to snow showers overnight. There is the possibility of an accumulation by tomorrow morning! While temperatures have been mild enough to possibly keep some of the snow from sticking to the roadways, I wouldn't be suprised if we see a slushy accumulation on grassy surfaces. An intense low pressure storm system is located just east of the eastern end of Lake Superior in Ontario Canada at 11 pm cdt. Because of the very tight pressure gradient around the low fairly strong winds continue to buffet the Stateline tonight. Overnight the wind will slowly subside, but still whistle through the area from the west/northwest at 15-25 mph with gusts above 30 mph. There could be a slight let up toward morning along with partial clearing. The low will be in the low 30's. The breezes will pick up again in the morning on Sunday, and may again gust above 30 mph, before diminishing in the afternoon. Skies will be partly sunny on Sunday with weak high pressure taking control of area weather, and the high will reach the low 50's. That's still cool, but much nicer than it was on Saturday. On Sunday night the next storm system to affect the midwest will send a lead impulse across the plains across Illinois giving the Stateline a chance of some light rain showers. On Monday the storm system will begin to ogranize in the Rockies as a warm front begins to push northward across Missouri and southern Illinois. That could scatter some light rain showers into northern Illinois. On Monday night some serious over-running of Gulf moisture over the front lying to our south will take place. Showers and thunderstorms will spread across the area, and continue off and on thru Tuesday night when an strong area of low pressure will move across Illinois just to our south. Wednesday will be a mostly cloudy, windy, chilly day with a good chance of showers as the low pulls away from the Stateline across Michigan into southeastern Ontario. As the main low pulls through northeast Illinois this morning, it's bringing down enough cold air to keep the snow falling on the backside. As of 8:30 am, light snow was reported at Dubuque. As the low continues to move through, there could be a few snow showers that move across sections of northern Illinois and southern Wisconsin. Is There Any Warmth in Our Future? While the weather this weekend looks cool there may be a slight warm up heading into the middle of next week. Yesterday it looked as if temperatures would remain below average through the remainder of April but this morning one of our weather models is hinting at the possibility of 70s by next Tuesday. While I'm not completely sold on this yet, it isn't out of the question. Another area of low pressure will develop Monday lifting a warm front through Illinois Monday night. Just how far north the warm front makes it is still in question. The GFS model pushes the front north of the Wisconsin/Illinois border allowing temperatures to rise into the low 70s before swinging a cold front through. The European model keeps the front to our south with the low in northern Missouri and temperatures in the 50s. I'm tempted to side a little more with the European model since this past week it has had a fairly good track record, but it sure would be nice to see the 70s again. Either way it does look like rain will be a definite during that time frame. A Wind Advisory continues for southern Wisconsin and northern Illinois through this evening as winds will likely gust near 40 mph, or better. The winds will be accompanied by rain showers and maybe even a few isolated storms (especially to the south) as an area of low pressure moves into northern Illinois tonight. Wind gusts were already nearing 40 mph across the immediate Stateline and actually close to 50 mph near Moline and Sterling. Loose objects such as lawn furniture and garbage cans could blow around and travel on north/south roads will likely be difficult. This is the reason for all the wind, severe weather and snow yesterday and today. A very strong area of low pressure will strengthen as it moves into northern Missouri later today and eventually into northeast Illinois by Saturday morning. Out ahead of it severe weather in the south and it's actually pulling down enough cold air to cause snow, significant snow at that, across the Plains. We are on the north side of this system and as it does continue to strengthen the winds will likely remain at this pace through tonight. This image depicts the mean sea level pressure and temperatures of the U.S. I've highlighted where the low currently sits and look how closely spaced the pressure lines are. The closer the lines are together, the stronger the winds will be. The reason why the winds will remain this gusty into tonight is because pressure falls ahead of the low are fairly significant; which is an indication that the low will strengthen. Once the low moves overhead tonight the winds may relax some, but it will still be breezy. As the low moves over the Great Lakes Saturday winds will probably pick up again but likely not be as gusty as they are today. Check out this video from TornadoVideos.net of a multi-vortex tornado near Tushka/Atoka Oklahoma Thursday afternoon. So far, ten tornadoes have been reported stretching through Kansas and Oklahoma as a massive storm system continues to spin through the central of the country. Unfortunately, five people lost their lives from the storms yesterday and as the system continues to move across the south, three more fatalities have been reported. You can hear the chasers in the video on the phone with who I'm assuming is either the National Weather Service or some emergency official. And towards the end you can really hear the hail hitting the vehicle as the storm continues to move on. Absolutely amazing! Ongoing tornado watches and warnings continue for the southern states this morning. (4/15/2011 12:52:24 AM) nwsbot: LBF: Ogallala [Keith Co, NE] emergency mngr reports BLIZZARD at 12:46 AM CDT -- numerous motorists have been stuck on interstate 80 between ogallala and paxton for upwards to 8 hours due to accidents. intestate 80 is closed for travel west of north platte. A strengthening area of low pressure will continue to develop across the southern Plains this afternoon pulling warm, moist air out ahead of it. For us, this will leave us with a damp, cool and windy Thursday and the potential for heavy rainfall Friday afternoon. For residents to the south, severe weather is a very good possibility today and tomorrow. On the northern edge of the system, a mid-April snow storm could bring over six inches of snow for folks in the northern Plains! Winter Weather Watches/Warnings and Advisories extend from North Dakota down into far northwest Kansas. This low will stay to the south of us Friday increasing our winds as it pulls up through the lower Great Lakes Saturday morning. Earlier this week the potential was there to see a few wet flakes mix in by Saturday morning, but as of now it appears temperatures Friday night won't be as cold. Let's hope it stays that way! I have a feeeling many of you may be asking just when the 70° weather will be returning. According to the Climate Prediction Center, it may not be for a while. Highs this time of year should aveage in the upper 50s and low 60s towards the end of the month. It looks like we'll stay either right at that or just slightly below heading into next week. There is one storm system that will bear some watching into next week because it may provide a day or so of warmer weather, but overall trends continue to show the end of April a little cool. As far as precipitation goes we've got one system coming in Friday and then another one next week that could bring copious amounts of rainfall to the Great Lakes. 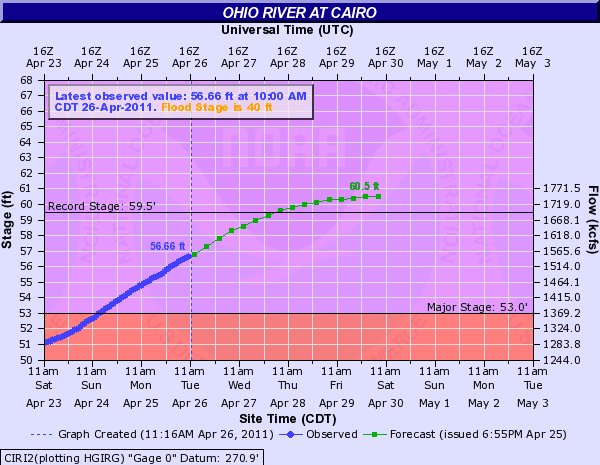 Something we'll continue to track as there are a few local rivers that are sitting a little high. 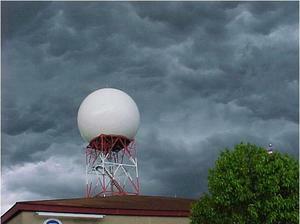 The National Weather Service Romeoville's radar has been shut down. The gearing in the radar pedestal has failed. This was found when the office was doing other routine maintenance. The NWS is estimating that the radar will not be fixed for another two weeks. Most of our viewing area is covered by the this radar, however, will be using surrounding radar from Davenport, Milwaukee, La Crosse and Lincoln should weather threaten our area. The annual Fermilab Tornado and Severe Storm Seminar, with WGN TV's Chief Meteorologist Tom Skilling, will be Saturday April 30 at 12:00 noon and again at 6:00 pm. The program will be held in the Ramsey Auditorium at the Fermi National Accelerator Laboratory, located in Batavia, IL. The seminar is free and open to anyone. Seating is limited and is first come first served. The prorgam lasts about 4 hours. The entrance to Fermilab is off Kirk Road, about 3 miles north of the Kirk/Farnsworth exit off I-88. With all the mild weather the past couple of days it may be a little tempting to get a head start in the garden. And while some plants may be able to handle temperatures that fall below 32°, it might be a good idea to wait at least another week or so. While the actual date will vary from year to year, the average last spring frost usually occurs anywhere between the 21st and 28th of April. Now for tender plants you may want to add on about two weeks to that date. Open, grassy surfaces are usually the first to experience frost while locations that sit under trees are more protected because the tree helps keep the heat from escaping. It's not unusal to see farmers out in the fields by the middle of April. I was talking with my dad the other night (who used to be a dairy farmer) and he said back in the day the rule of thumb was to be out in the field by the middle of May. Now because crop seeds have improved over the recent years they have gotten a little better to withstand cooler temperatures, so sometimes you'll see the tractors in the fields before May. One of our viewers, Dom Castaldo, also noted that because the growing part of corn is below the ground it can usually survive colder weather. On the other hand, soybeans have the growing area above ground so a frost would likely kill a soybean plant. He also says the key to planting is soil temperature. Soil must be 52° before corn will germinate. Soybeans need a warmer soil temperature. Red Flag Warnings will continue through Thursday night for sections of west Texas and the entire state on New Mexico as relative humidity values remain very low. High temperatures there are expected to reach into the 80s and 90s; combine that with low dew points and gusty winds and this creates a very high fire danger threat. Relative humidity values could actually reach as low as 5-10% today and tomorrow. A dry-line will move through west Texas only increasing winds before a pacific system moves in at the end of the week and brings some relief. This comes as parts of Texas and southern New Mexico are experiencing major drought and unfortunately it doesn't appear as if things will be getting any better. According to the Texas Forest Service they responded to 13 fires buring 1,035 acres Tuesday and in the past seven days, over 80 fires have been reported burning 442,461 acres. There are 191 Texas counties that are reporting burn bans. Chicago NWS meteorologist Gino Izzi put together a very nice presentation as to what just exactly happened with the severe weather in our area Sunday. Meanwhile, Sunday's twisters in Wisconsin will go down as one of the bigger tornado outbreaks in Wisconsin's history during the month of April. So far, the NWS has confirmed 10 tornadoes. There are a number of small ways you can save on gas during this time of rising gas prices. One of them is weather-related. Try filling-up your car early in the morning or during a colder day. Like almost any other fluid, gasoline expands when it's heated. So filling up during the morning -- before the gas has had a chance to heat-up inside those underground storage tanks -- will give you "more bang for your buck." The summer-like weather we had this past weekend will likely be a distant memory by next weekend. A change in the jetstream pattern will allow much cooler air from the north to spill into the northern Plains and Great Lakes likely by Friday and continue into Saturday and Sunday. Later this week strong winds within the jetstream will move into the Pacific Northwest. Out ahead of it high pressure will bring us a couple nice days before an area of low pressure develops, moves just to the south and pulls down cool, canadian air once again. It's possible that temperatures this weekend may not get out of the middle 40s. Rain showers will be likely Thursday and then again on Friday but overnight lows could drop below freezing which would give us a chance to see any liquid precipitation possibly change over to a mix of snow and rain! Fellow meteorologist Chad Franzen from WSAW in Wausau, WI shared this video of the storm as it moved through Merrill, WI Sunday afternoon. Overall, seven tornadoes were reported in Wisconsin yesterday. Towards the end of the video the tornado sirens begin...very eerie feeling! We will continue to update this page throughout the day as we receive more information and data. Please be sure to keep checking back for all the latest information. 10:00 pm Update: Line of storms now stretch from just east of Janesville southwest through western Winnebago county and back through Ogle and Lee counties. Frequent lightning, brief heavy downpours, hail and winds will be common. Once these storms pass this will be it for the evening. Severe Thunderstorm Warning now for Jo Daviess, Carroll and Stephenson counties until 9:45 pm. This storm was near Winslow to Savanna. Cities in its path are: Pearl City, Chadwick, Cedarville, Lanark, Shannon, Freeport, Dakota, Rock City. Gusty winds and pea sized hail will be possible with these storms. 7:30 pm Update: Cold front stretches from just west of Dubuque southwest through eastern Iowa. There are a few storms that have formed along the front; mainly southwest of the Quad Cities. There is one cell now moving into parts of Whiteside and Lee counties. This storm, however, has appeared to weaken some. We'll continue to watch for the development of those storms that are southwest of the Quad Cities but with the sun ready to set shortly we will likely lose some of our instability, thus reducing the tornado threat. Tornado Watch issued for Stephenson, Jo Daviess, Carroll, Whiteside, Winnebago, Boone, McHenry, Ogle, Lee and DeKalb counties until 1am. 3:30 pm Update: PDS (Particularly Dangerous Situation) Tornado Watch has been issued for almost the entire state of Wisconsin. This does not include Green, Rock or Walworth counties. The moderate risk has also been shifted further to the north while the slight risk covers our region. There are a few storms that are beginning to develop in northeast Iowa and will continue to move northeast into Wisconsin with the very strong southwest upper level winds. What we'll be watching for is any development southward along or just ahead of the cold front in southern Iowa. Those storms would hold the best chance of arriving into our area. Storms will likely hold off until after dinner time. 1:45 pm Update: Severe weather watch will likely be issued for parts of the area within the next hour or so. Southerly winds continue to pull warm and humid air northward ahead of a cold front that currently stretches through southern Minnesota and central Iowa. Already starting to see cumulus clouds build out ahead of the front and expect storms to form in east/northeast Iowa and quickly race to the northeast into far northwest Illinois and southern Wisconsin. Storms will probably form west of the Mississippi River and may move west of Rockford sometime after 5pm. It looks like the majority of this afternoon will remain dry. 9:30 am Update: Just as I suspected yesterday, the moderate risk has been shifted to the northwest and now covers almost all of Wisconsin, extreme northwest Illinois, northeast Iowa and eastern Minnesota. A tornado outbreak occurred in northwest Iowa yesterday closer to the warm front and low pressure system with 27 reports of tornadoes. Now that low sits in southwest Minnesota with the warm front stretching through southern Minnesota and central Wisconsin. Temperatures are already rising into low 70s with dew points nearing upper 50s this morning. Our atmosphere will likely remained capped, meaning warm air aloft will keep air from rising and forming storms, through the early afternoon. It probably won't be until later in the day when a jet streak arrives, stronger winds within the jetstream, that the cap will weaken. This looks to be around the Minnesota/northern Iowa border. Now, because the warm front is already in Wisconsin and the low will be moving into Wisconsin later today that area has the biggest threat for seeing a tornado outbreak. Originally, I was a little hesitant on the dry-line/convergence line forming this far east. And as of this morning I'm having a hard time finding it, but it may show up later. If it were to have developed it would have been our triggering mechanism for storms. Also, because the low is further to our northwest and the warm front is north, this is where the greatest directional wind shear will occur - thus the greatest tornado threat. Storms may actually form along the cold front as it moves east into our region this evening. Now, I'm not saying our tornado threat is zero because if we do see storms this afternoon they could still turn severe and we would still be looking at the possibility of damaging winds, hail, and an isolated tornado. We will continue to monitor the evolution of this system and keep you updated throughout the day. I still want to stress that even though the moderate risk has been shifted further northwest you should still keep tabs on the forecast.